Dearest People, Here I really sit at a front window of the Bath Hotel, Piccadilly. It's not a fashionable place, but Uncle stopped here years ago, and won't go anywhere else. However, we don't mean to stay long, so it's no great matter. Oh, I can't begin to tell you how I enjoy it all! I never can, so I'll only give you bits out of my notebook, for I've done nothing but sketch and scribble since I started. I sent a line from Halifax, when I felt pretty miserable, but after that I got on delightfully, seldom ill, on deck all day, with plenty of pleasant people to amuse me. Everyone was very kind to me, especially the officers. Don't laugh, Jo, gentlemen really are very necessary aboard ship, to hold on to, or to wait upon one, and as they have nothing to do, it's a mercy to make them useful, otherwise they would smoke themselves to death, I'm afraid. Aunt and Flo were poorly all the way, and liked to be let alone, so when I had done what I could for them, I went and enjoyed myself. Such walks on deck, such sunsets, such splendid air and waves! It was almost as exciting as riding a fast horse, when we went rushing on so grandly. I wish Beth could have come, it would have done her so much good. As for Jo, she would have gone up and sat on the maintop jib, or whatever the high thing is called, made friends with the engineers, and tooted on the captain's speaking trumpet, she'd have been in such a state of rapture. It was all heavenly, but I was glad to see the Irish coast, and found it very lovely, so green and sunny, with brown cabins here and there, ruins on some of the hills, and gentlemen's countryseats in the valleys, with deer feeding in the parks. It was early in the morning, but I didn't regret getting up to see it, for the bay was full of little boats, the shore so picturesque, and a rosy sky overhead. I never shall forget it. "Oh, have you e'er heard of Kate Kearney? She lives on the banks of Killarney; From the glance of her eye, Shun danger and fly, For fatal's the glance of Kate Kearney." We only stopped at Liverpool a few hours. It's a dirty, noisy place, and I was glad to leave it. Uncle rushed out and bought a pair of dogskin gloves, some ugly, thick shoes, and an umbrella, and got shaved `a la mutton chop, the first thing. Then he flattered himself that he looked like a true Briton, but the first time he had the mud cleaned off his shoes, the little bootblack knew that an American stood in them, and said, with a grin, "There yer har, sir. I've given `em the latest Yankee shine." It amused Uncle immensely. Oh, I must tell you what that absurd Lennox did! He got his friend Ward, who came on with us, to order a bouquet for me, and the first thing I saw in my room was a lovely one, with "Robert Lennox's compliments," on the card. Wasn't that fun, girls? I like traveling. I never shall get to London if I don't hurry. The trip was like riding through a long picture gallery, full of lovely landscapes. The farmhouses were my delight, with thatched roofs, ivy up to the eaves, latticed windows, and stout women with rosy children at the doors. The very cattle looked more tranquil than ours, as they stood knee-deep in clover, and the hens had a contented cluck, as if they never got nervous like Yankee biddies. Such perfect color I never saw, the grass so green, sky so blue, grain so yellow, woods so dark, I was in a rapture all the way. So was Flo, and we kept bouncing from one side to the other, trying to see everything while we were whisking along at the rate of sixty miles an hour. Aunt was tired and went to sleep, but Uncle read his guidebook, and wouldn't be astonished at anything. This is the way we went on. Amy, flying up--"Oh, that must be Kenilworth, that gray place among the trees!" Flo, darting to my window--"How sweet! We must go there sometime, won't we Papa?" Uncle, calmly admiring his boots--"No, my dear, not unless you want beer, that's a brewery." A pause--then Flo cried out, "Bless me, there's a gallows and a man going up." "Where, where?" shrieks Amy, staring out at two tall posts with a crossbeam and some dangling chains. "A colliery," remarks Uncle, with a twinkle of the eye. "Here's a lovely flock of lambs all lying down," says Amy. "See, Papa, aren't they pretty?" added Flo sentimentally. "Geese, young ladies," returns Uncle, in a tone that keeps us quiet till Flo settles down to enjoy the FLIRTATIONS OF CAPTAIN CAVENDISH, and I have the scenery all to myself. Of course it rained when we got to London, and there was nothing to be seen but fog and umbrellas. We rested, unpacked, and shopped a little between the showers. Aunt Mary got me some new things, for I came off in such a hurry I wasn't half ready. A white hat and blue feather, a muslin dress to match, and the loveliest mantle you ever saw. Shopping in Regent Street is perfectly splendid. Things seem so cheap, nice ribbons only sixpence a yard. I laid in a stock, but shall get my gloves in Paris. Doesn't that sound sort of elegant and rich? I gave my order as soberly as I could, and slamming down the door, with an "Aye, aye, mum," the man made his horse walk, as if going to a funeral. I poked again and said, "A little faster," then off he went, helter-skelter as before, and we resigned ourselves to our fate. Today was fair, and we went to Hyde Park, close by, for we are more aristocratic than we look. The Duke of Devonshire lives near. I often see his footmen lounging at the back gate, and the Duke of Wellington's house is not far off. Such sights as I saw, my dear! It was as good as Punch, for there were fat dowagers rolling about in their red and yellow coaches, with gorgeous Jeameses in silk stockings and velvet coats, up behind, and powdered coachmen in front. Smart maids, with the rosiest children I ever saw, handsome girls, looking half asleep, dandies in queer English hats and lavender kids lounging about, and tall soldiers, in short red jackets and muffin caps stuck on one side, looking so funny I longed to sketch them. Rotten Row means `Route de Roi', or the king's way, but now it's more like a riding school than anything else. The horses are splendid, and the men, especially the grooms, ride well, but the women are stiff, and bounce, which isn't according to our rules. I longed to show them a tearing American gallop, for they trotted solemnly up and down, in their scant habits and high hats, looking like the women in a toy Noah's Ark. Everyone rides--old men, stout ladies, little children-- and the young folks do a deal of flirting here, I say a pair exchange rose buds, for it's the thing to wear one in the button-hole, and I thought it rather a nice little idea. In the P.M. to Westminster Abbey, but don't expect me to describe it, that's impossible, so I'll only say it was sublime! This evening we are going to see Fechter, which will be an appropriate end to the happiest day of my life. It's very late, but I can't let my letter go in the morning without telling you what happened last evening. Who do you think came in, as we were at tea? Laurie's English friends, Fred and Frank Vaughn! I was so surprised, for I shouldn't have known them but for the cards. both are tall fellows with whiskers, Fred handsome in the English style, and Frank much better, for he only limps slightly, and uses no crutches. They had heard from Laurie where we were to be, and came to ask us to their house, but Uncle won't go, so we shall return the call, and see them as we can. They went to the theater with us, and we did have such a good time, for Frank devoted himself to Flo, and Fred and I talked over past, present, and future fun as if we had know each other all our days. Tell Beth Frank asked for her, and was sorry to hear of her ill health. Fred laughed when I spoke of Jo, and sent his `respectful compliments to the big hat'. Neither of them had forgotten Camp Laurence, or the fun we had there. What ages ago it seems, doesn't it? In my last I told you about our London visit, how kind the Vaughns were, and what pleasant parties they made for us. I enjoyed the trips to Hampton Court and the Kensington Museum more than anything else, for at Hampton I saw Raphael's cartoons, and at the Museum, rooms full of pictures by Turner, Lawrence, Reynolds, Hogarth, and the other great creatures. The day in Richmond Park was charming, for we had a regular English picnic, and I had more splendid oaks and groups of deer than I could copy, also heard a nightingale, and saw larks go up. We `did' London to our heart's content, thanks to Fred and Frank, and were sorry to go away, for though English people are slow to take you in, when they once make up their minds to do it they cannot be outdone in hospitality, I think. The Vaughns hope to meet us in Rome next winter, and I shall be dreadfully disappointed if they don't, for Grace and I are great friends, and the boys very nice fellows, especially Fred. Well, we were hardly settled here, when he turned up again, saying he had come for a holiday, and was going to Switzerland. Aunt looked sober at first, but he was so cool about it she couldn't say a word. And now we get on nicely, and are very glad he came, for he speaks French like a native, and I don't know what we should do without him. Uncle doesn't know ten words, and insists on talking English very loud, as if it would make people understand him. Aunt's pronunciation is old-fashioned, and Flo and I, though we flattered ourselves that we knew a good deal, find we don't, and are very grateful to have Fred do the `parley vooing', as Uncle calls it. Such delightful times as we are having! Sight-seeing from morning till night, stopping for nice lunches in the gay cafes, and meeting with all sorts of droll adventures. Rainy days I spend in the Louvre, revelling in pictures. Jo would turn up her naughty nose at some of the finest, because she has no soul for art, but I have, and I'm cultivation eye and taste as fast as I can. She would like the relics of great people better, for I've seen her Napoleon's cocked hat and gray coat, his baby's cradle and his old toothbrush, also Marie Antoinette's little shoe, the ring of Saint Denis, Charlemagne's sword, and many other interesting things. I'll talk for hours about them when I come, but haven't time to write. The Palais Royale is a heavenly place, so full of bijouterie and lovely things that I'm nearly distracted because I can't buy them. Fred wanted to get me some, but of course I didn't allow it. Then the Bois and Champs Elysees are tres magnifique. I've seen the imperial family several times, the emperor an ugly, hard-looking man, the empress pale and pretty, but dressed in bad taste, I thought--purple dress, green hat, and yellow gloves. 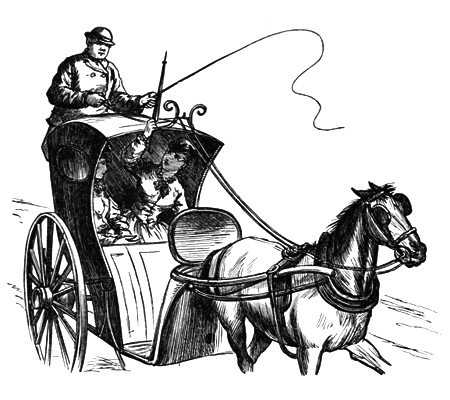 Little Nap is a handsome boy, who sits chatting to his tutor, and kissed his hand to the people as he passes in his four-horse barouche, with postilions in red satin jackets and a mounted guard before and behind. We often walk in the Tuileries Gardens, for they are lovely, though the antique Luxembourg Gardens suit me better. Pere la Chaise is very curious, for many of the tombs are like small rooms, and looking in, one sees a table, with images or pictures of the dead, and chairs for the mourners to sit in when they come to lament. That is so Frenchy. Our rooms are on the Rue de Rivoli, and sitting on the balcony, we look up and down the long, brilliant street. It is so pleasant that we spend our evenings talking there when too tired with our day's work to go out. Fred is very entertaining, and is altogether the most agreeable young man I ever knew-- except Laurie, whose manners are more charming. I wish Fred was dark, for I don't fancy light men, however, the Vaughns are very rich and come of an excellent family, so I won't find fault with their yellow hair, as my own is yellower. Next week we are off to Germany and Switzerland, and as we shall travel fast, I shall only be able to give you hasty letters. I keep my diary, and try to `remember correctly and describe clearly all that I see and admire', as Father advised. It is good practice for me, and with my sketchbook will give you a better idea of my tour than these scribbles. Having a quiet hour before we leave for Berne, I'll try to tell you what has happened, for some of it is very important, as you will see. The sail up the Rhine was perfect, and I just sat and enjoyed it with all my might. Get Father's old guidebooks and read about it. I haven't words beautiful enough to describe it. At Coblenz we had a lovely time, for some students from Bonn, with whom Fred got acquainted on the boat, gave us a serenade. It was a moonlight night, and about one o'clock Flo and I were waked by the most delicious music under our windows. We flew up, and hid behind the curtains, but sly peeps showed us Fred and the students singing away down below. It was the most romantic thing I ever saw--the river, the bridge of boats, the great fortress opposite, moonlight everywhere, and music fit to melt a heart of stone. When they were done we threw down some flowers, and saw them scramble for them, kiss their hands to the invisible ladies, and go laughing away, to smoke and drink beer, I suppose. Next morning Fred showed me one of the crumpled flowers in his vest pocket, and looked very sentimental. I laughed at him, and said I didn't throw it, but Flo, which seemed to disgust him, for he tossed it out of the window, and turned sensible again. I'm afraid I'm going to have trouble with that boy, it begins to look like it. The baths at Nassau were very gay, so was Baden-Baden, where Fred lost some money, and I scolded him. He needs someone to look after him when Frank is not with him. Kate said once she hoped he'd marry soon, and I quite agree with her that it would be well for him. Frankfurt was delightful. I saw Goeth's house, Schiller's statue, and Dannecker's famous Ariadne. It was very lovely, but I should have enjoyed it more if I had known the story better. I didn't like to ask, as everyone knew it or pretended they did. I wish Jo would tell me all about it. I ought to have read more, for I find I don't know anything, and it mortifies me. Now comes the serious part, for it happened here, and Fred has just gone. He has been so kind and jolly that we all got quite fond of him. I never thought of anything but a traveling friendship till the serenade night. Since then I've begun to feel that the moonlight walks, balcony talks, and daily adventures were something more to him than fun. I haven't flirted, Mother, truly, but remembered what you said to me, and have done my very best. I can't help it if people like me. I don't try to make them, and it worries me if I don't care for them, though Jo says I haven't got any heart. Now I know Mother will shake her head, and the girls say, "Oh, the mercenary little wretch! ", but I've made up my mind, and if Fred asks me, I shall accept him, though I'm not madly in love. I like him, and we get on comfortably together. He is handsome, young, clever enough, and very rich--ever so much richer than the Laurences. I don't think his family would object, and I should be very happy, for they are all kind, well-bred, generous people, and they like me. Fred, as the eldest twin, will have the estate, I suppose, and such a splendid one it is! A city house in a fashionable street, not so showy as our big houses, but twice as comfortable and full of solid luxury, such as English people believe in. I like it, for it's genuine. I've seen the plate, the family jewels, the old servants, and pictures of the country place, with its park, great house, lovely grounds, and fine horses. Oh, it would be all I should ask! And I'd rather have it than any title such as girls snap up so readily, and find nothing behind. I may be mercenary, but I hate poverty, and don't mean to bear it a minute longer than I can help. One of us must marry well. Meg didn't, Jo won't, Beth can't yet, so I shall, and make everything okay all round. I wouldn't marry a man I hated or despised. You may be sure of that, and though Fred is not my model hero, he does very well, and in time I should get fond enough of him if he was very fond of me, and let me do just as I liked. So I've been turning the matter over in my mind the last week, for it was impossible to help seeing that Fred liked me. He said nothing, but little things showed it. He never goes with Flo, always gets on my side of the carriage, table, or promenade, looks sentimental when we are alone, and frowns at anyone else who ventures to speak tome. Yesterday at dinner, when an Austrian officer stared at us and then said something to his friend, a rakish-looking baron, about `ein wonderschones Blondchen', Fred looked as fierce as a lion, and cut his meat so savagely it nearly flew off his plate. He isn't one of the cool, stiff Englishmen, but is rather peppery, for he has Scotch blood in him, as one might guess from his bonnie blue eyes. Well, last evening we went up to the castle about sunset, at least all of us but Fred, who was to meet us there after going to the Post Restante for letters. We had a charming time poking about the ruins, the vaults where the monster tun is, and the beautiful gardens made by the elector long ago for his English wife. I liked the great terrace best, for the view was divine, so while the rest went to see the rooms inside, I sat there trying to sketch the gray stone lion's head on the wall, with scarlet woodbine sprays hanging round it. I felt as if I'd got into a romance, sitting there, watching the Meckar rolling through the valley, listening to the music of the Austrian band below, and waiting for my lover, like a real storybook girl. I had a feeling that something was going to happen and I was ready for it. I didn't feel blushy or quakey, but quite cool and only a little excited. By-and-by I heard Fred's voice, and then he came hurrying through the great arch to find me. He looked so troubled that I forgot all about myself, and asked what the matter was. He said he'd just got a letter begging him to come home, for Frank was very ill. So he was going at once on the night train and only had time to say good-by. I was very sorry for him, and disappointed for myself, but only for a minute because he said, as he shook hands, and said it in a way that I could not mistake, "I shall soon come back, you won't forget me, Amy?" I didn't promise, but I looked at him, and he seemed satisfied, and there was no time for anything but messages and good-byes, for he was off in an hour, and we all miss him very much. I know he wanted to speak, but I think, from something he once hinted, that he had promised his father not to do anything of the sort yet a while, for is is a rash boy, and the old gentleman dreads a foreign daughter-in-law. We shall soon meet in Rome, and then, if I don't change my mind, I'll say "Yes, thank you," when he says "Will you, please?" Of course this is all very private, but I wished you to know what was going on. Don't be anxious about me, remember I am your `prudent Amy', and be sure I will do nothing rashly. Send me as much advice as you like. I'll use it if I can. I wish I could see you for a good talk, Marmee. Love and trust me.